Cards on the table right up front: I do not like football. Never have. Actively dislike it, in fact. Since childhood, I associated football players with bullying and cruelty, and through elementary, middle and high school, that association was never challenged. In my sophomore year of high school, a friend and I landed in a second period PE class that happened to be taught by the varsity football coach and included, as our classmates, the entire varsity football team. It was a yearlong nightmare. I have family members who looooooove football, especially at the college and professional level, so it was always around. And my dad happens to be one of the world’s biggest fans of the San Francisco 49ers – well, he used to be. Not so much these days. It turns out that not only do my dad and I feel differently about football, but also have wildly diverging viewpoints on the actions of former 49er quarterback Colin Kaepernick. It was with trepidation that I went to opening night of the world premiere drama Candlestick by Bennett Fisher and produced by Campo Santo, long one of the Bay Area’s best incubators of new plays. In the intimate setting of the ACT Costume Shop, the football vibe is strong from the minute you walk in the door. The lobby is set up as an elaborate tailgate party complete with chili and Red Vines and game highlights on a TV screen. 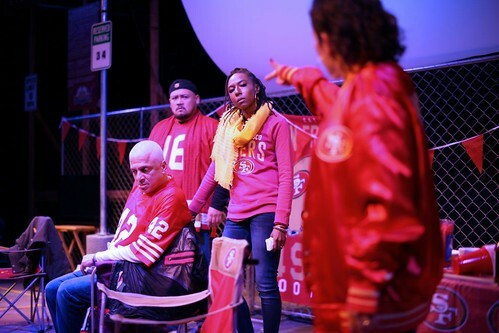 There’s a pre-show whoop-whoop session to get folks riled up and ready to scream and shout, even though there are only a few moments in the play where we are encouraged to chant things like, “Niners! Niners! Niners!” (something I will never, ever do). 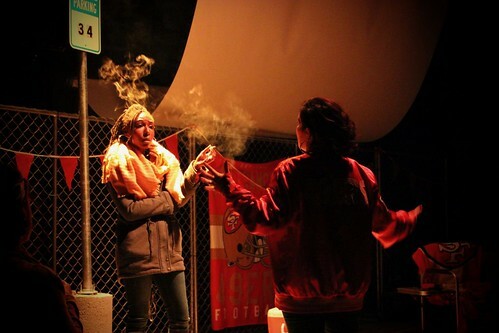 That football vibe extends to the evocative parking lot set by Tanya Orellana’s – chainlink fence draped with 49ers banners, streetlights and the requisite food table (jalapeño tortilla chips seem to dominate) and ice chests full of beer. Maximiliano Urruzmendi’s lights swirl around like a halftime show, and projections (by Joan Osato) on a billowy screen above the action show us aerial footage of the stadium and tell us which team the Niners are facing. Act 1 scenes are all before the games. Act 2 scenes are all after the games. My hope in going to a play about football is that the human drama will dominate the stage and not the actual game or the mania surrounding the game. We all have our passions, and those passions can create powerful connections to other people who are similarly inclined. We use our hobbies as a means of communication and as a safe place to express emotions that might otherwise make us uncomfortable in our “real” life. All of that is definitely part of Fisher’s script, but this play is heavy with football. I can guarantee that if you like football, especially the 49ers, you will enjoy this two-hour experience much more than I did. The drama here involves Lloyd, played by the vibrant Donald E. Lacy Jr., who is the king of his own little tailgate kingdom. From his comfy chair (covered by a 49ers blanket, naturally), he drinks beer and talks plays and statistics and smack talks opponents with his pals. Hugo (Juan Amador) and Karl (Brian Rivera) are as enthusiastic as Lloyd but in different ways. While Hugo is like a tornado of energy, Karl is more circumspect and less voluble. Martina (Anna Maria Luera), another enthusiastic fan, now runs her family’s company, a successful company that has contracted with Lloyd for more than 30 years but never made him an actual employee. That’s the core crew, though we do meet some other folks, most notably Lloyd’s daughter Riley (Britney Frazier), whose relationship with her dad (and football) has not always been on sure footing. Aside from Lloyd’s erratic and volatile behavior, Britney’s motivation – is she acting selfishly or really trying to help her dad? – provides the play’s tension. Director Ellen Sebastian Chang certainly gets lively and enthusiastic performances from her cast. There’s a real sense of connection among the core members of this group, and when things begin to rupture, it’s interesting to see how sturdy (or not) the football friendship connection really is. There’s a tendency toward melodrama in the play’s second half, and the final scenes, with a mysterious figure in gold suit, are so out of sync with the rest of the play they just seem absurd. There’s an attempt to address changing attitudes about football – the player demonstrations, the toxic masculinity, the concussions – but it all seems slight amid the glorification of the sport that fuels the tailgate crowd. If I was supposed to feel bad or sad or conflicted about the destruction of Candlestick and for what it meant to people through the decades, I did not.